In the upper northeast corner of Arkansas - not far from the Missouri border - is Peach Orchard in Clay County, Arkansas. It's about ten miles west of Knobel, Arkansas, where the first American fractal formation was discovered in wheat on June 7, 2003. See More Information below. 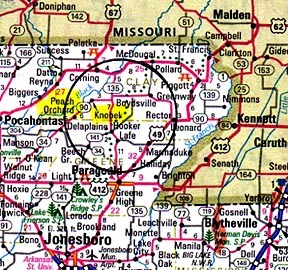 June 2, 2004 Peach Orchard, Arkansas - On the weekend of May 22-23, 2004, a crop duster pilot flew over a wheat field owned by Rodney Schimmings in Peach Orchard, Arkansas, and reported seeing a seven-spoked "wagon wheel" crop formation. Unlike England, there are no tractor tramlines in the wheat. The farm owner told me he looked for signs of entry, but could not find any. Reporter Fred Martin at the Clay County Courier newspaper in Corning heard the news and arranged with Mr. Schimmings to take photographs.